Mark Hall, program director of the UCF Writing Center (UWC) and professor in the Department of Writing & Rhetoric, knows what it’s like to be in the shoes of his student-tutors. As an undergraduate, he was a writing center tutor himself and learned first-hand how daunting the job can be. With that revelation, Hall set off to change that in the writing centers he directed. Before UCF, he directed two other centers. At UCF, he created ENC4275, a credit-bearing course that teaches students about writing center research, theory and practice. Every student who wants to be a UWC tutor is required to take the course. Hall’s interest in tutor education was the catalyst for his book “Around the Texts of Writing Center Work,” which won the International Writing Center Association award for Outstanding Book/Major Work of 2018. 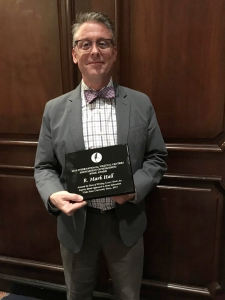 The award is given to one book a biennium that makes a significant contribution to the scholarship of and research on writing centers. In his book, Hall illustrates how educating tutors enhances their professional development. If the extensive research in his book weren’t enough, one look at Hall’s inbox is proof of the value of being a student-tutor. He has received countless emails from past tutors thanking him for the experiences they had at the UWC. Some have even said that the skills they gained as a tutor helped them land their dream jobs, gain acceptances into competitive graduate schools and make other strides in their careers. The UWC has expanded both in location and reach since English professor Beth Rapp Young founded it in the mid-90s. 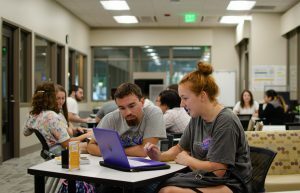 What used to be housed in a small trailer on campus — and then in a room in the original Colbourn Hall — has now moved to a modern, multimedia room in Trevor Colbourn Hall. Graduate students in the Texts & Technology doctoral program have developed a collaboration area where students can plug their laptops into a monitor and work together on assignments. Hall hopes to make the UWC even more accessible to students by expanding its online tutoring services and employing more tutors from diverse majors and language backgrounds. This sums up the main point that Hall is trying to make: the UWC is for everyone, not just struggling writers. “Every writer needs feedback, from the most confident writer to someone who might be afraid of writing,” said Hall. “Because of this, we work very hard with tutors to create an open, welcoming environment.” With its new, modern space in room 109 of Trevor Colbourn Hall — as well as Hall’s unwavering guidance — it’s safe to say that the UWC is on the ‘write’ track.